Accessory Pack - Collector's Club exclusive. Throughout history there have always been Hellspawns. Feudal Japan was no exception. 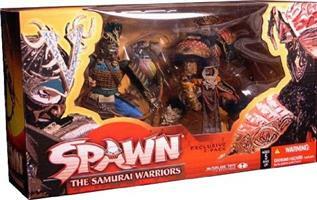 The six figures in the Samurai Wars re-create the core Spawn mythos and do it in style. These figures set a new high-water mark in detail, paint, articulation and accessories. Simply put, no other manufacturer has created action figures so playable, yet so beautifully detailed. Spawn Series 19 is unlike any action figure line McFarlane Toys ever created.